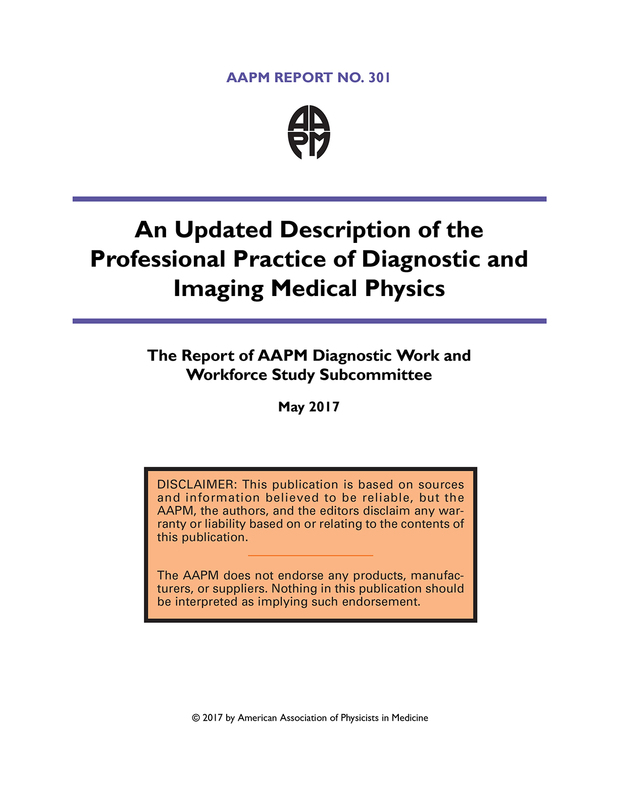 This report is a description of the current professional practice of diagnostic and imaging medical physics from the American Association of Physicists in Medicine’s (AAPM) Diagnostic Work and Workforce Study Subcommittee (DWWSS), and is not intended to be a revision to the AAPM Scope of Practice. Following publication of this report, AAPM intends to conduct a survey to more fully describe the current state of practice. Prior to a successful survey, however, this report aims to accomplish a critical primary objective, which is to create a common language and perspective among diagnostic and nuclear medical physicists by presenting a new taxonomy to describe their duties and services. A future survey of diagnostic and nuclear medical physicists will be created using concepts and terminology presented in this report. In the interim, the authors believe this report will assist diagnostic medical physicists and those who procure diagnostic medical physics services by providing updated consensus time estimates and effort considerations for some diagnostic medical physics services. Traditional ways to classify common diagnostic medical physics practice models (such as consultants, in-house or staff medical physicists, etc.) and practice settings (academic hospital, community hospital, free-standing center, etc.) no longer serve as an accurate means to characterize the work performed by diagnostic medical physicists in the modern healthcare environment. Furthermore, describing a service or offering as “comprehensive” may be intended to highlight the expertise of the individual providing the service, but may also imply that the service is unnecessary or excessively expensive. On the other hand, describing a service as “basic” may imply (favorably) that the cost is low, but also that the individual providing the service is less skilled or that the client is unwilling or unable to spend money or staff effort on anything that is not strictly required of them. Describing medical physics services as “basic” or “comprehensive,” or using similar terms, does not serve the purpose of this report. A new model for classification of diagnostic medical physics services is proposed: The Levels of Service (LoS) model. Level 1 services are regulatory requirements, requirements of national accreditation programs, or standards of nationally recognized professional societies, and are required to be performed by or under the supervision of a medical physicist. Level 1 services are well-defined, and there is a relatively high degree of agreement among medical physicists on procedures, time, and effort required to perform them. The most visible examples of Level 1 services are Equipment Performance Evaluations (EPEs), commonly referred to as medical physics surveys or equipment testing. Level 2 services are well-described and are frequently the responsibility of a medical physicist. Medical physicists add value when performing these services by applying their education, training, and expertise. This includes both non-mandatory services [e.g., designing a fluoroscopy safety program as described in the National Council on Radiation Protection and Measurements (NCRP) Report 168] and mandatory services [e.g., serving as the Radiation Safety Officer (RSO) for a diagnostic imaging facility]. Level 2 services are carried out according to methods, procedures, or standards contained in published national or international guidance. Level 2 services are not performed exclusively by medical physicists. Level 3 services are neither well-defined nor mandated by authorities outside the healthcare institution. Level 3 services are the least well-defined in terms of the amount of time or effort required. They may be broadly categorized as research or developmental services; they include basic science or clinical research, as well as development, testing, and use of new tools, techniques, or methods. This report also addresses Level 0 activities, which are essential activities that may be considered the cost of making diagnostic medical physics services available. Examples of Level 0 activities would include obtaining continuing education, calibrating instruments, obtaining and maintaining professional certifications, etc. Some of these activities, such as maintaining professional credentials, are mandatory; the medical physicist or their employer may see others as optional or negotiable. The subcommittee agrees unanimously that providing high-quality medical physics support includes, but often extends beyond, providing only Level 1 services. This report also discusses the evolution of medical physics services to lower levels, and it describes several common diagnostic medical physicist responsibilities in the current state of practice. Historically, diagnostic medical physics support requirements mostly have been quantified by considering imaging equipment inventories and time requirements for routine testing. However, practice has evolved to include services and activities that do not lend themselves to effort estimates based solely on equipment inventories. The present and future needs for diagnostic medical physics services and staffing are best evaluated using a study that accounts for the breadth and depth of services needed to promote and sustain quality patient care; these services are provided today in diverse practice models and settings that will likely evolve further over time. Some medical physics services and activities can and should be quantified via a focused survey of the AAPM membership, while others are difficult and unnecessary to quantify precisely. Those that are less quantifiable are also often those that are novel, emerging, or have not yet become a universal standard practice in all institutions. As such, they are growth opportunities for diagnostic medical physics. The pace of change in medical imaging suggests that further changes will affect diagnostic medical physics practice sooner than such a study could feasibly be repeated. A model that is flexible will maintain some predictive capability if it can be used with new data as they become available, allowing this resource to remain relevant for several years even in the face of major new developments.